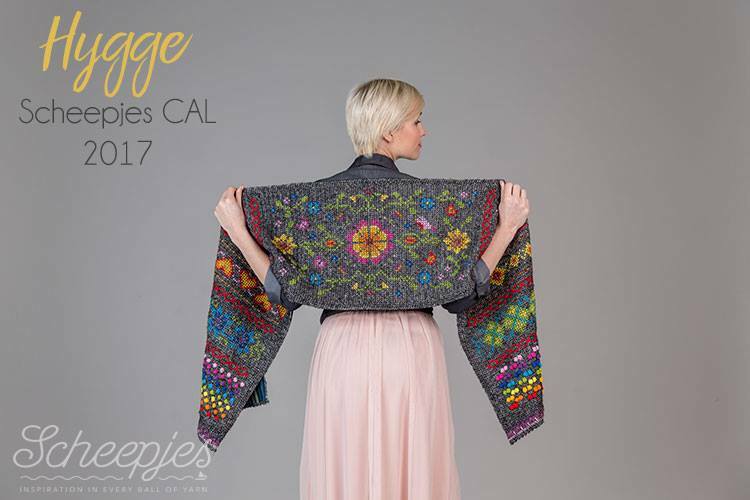 It is time to announce the first big project of the year, the all new Scheepjes CAL 2017 designed by the fabulous Kirsten from Haak Maar Raak. Hygge is the name of this CAL, and I have been practicing how to pronounce it, so I hope it is at least a little correct on the video tutorials. Yes, the words many of you have been wanting to hear are out; I will be making video tutorials for the Hygge CAL. We are making a long, rectangular wrap combining crochet and embroidery techniques to make a warm and cozy companion for many winter nights. The final wrap will measure approximately 190cm x 35cm. The design is new and interesting and I think an absolute winner; I have not seen a CAL quite like this before. Don’t feel stressed about the embroidery; it consists of cross stitches only and I will show you in a video how to make them. I will give you lots of tips along the way to make your work as neat and perfect as possible. There are three colorways available as a kit, the Rainbow colorway, Jewel colorway and Pastel colorway. I have the Rainbow colorway that I will be using for the video tutorials, but the Pastel is also fabulous, and I really LOVE the Jewel colors. Choosing can be such a problem sometimes….. The kits contain all the yarn you need to make the shawl, that is 10 balls of Stone Washed and 11 balls of Catona 25g. But this CAL would not be a Scheepjes CAL without all the attention to detail and the lovely extra’s. In addition to the yarn, the kits also contain a button, a charm, a stitch marker, a yarn needle and 2 wooden ice crystals. The kits are available for pre-order through Wool Warehouse and Caro’s Atelier (NL). Through the links you can make your preference known so that when the kits go on sale February 1st, you will have a higher change of getting the kit you want. We will be making the wrap using a 4.5mm (US size 7) crochet hook. If you don’t have this one in your collection, you still have time to buy one. Clover Amour hooks are my favorite hooks. Hygge CAL starts on 15 February 2017 and runs for 13 weeks. Each week a part of the pattern will be released in the International and Dutch Facebook groups as well as on the Scheepjes website. The written patterns will be available in English (US & UK Terms), Dutch and Swedish. I will have videos available in English (UK Terms) and Dutch, as well as right and left handed versions. The videos will be available through my blog, the two Facebook groups, the Scheepjes website and my YouTube channel. Join the Dutch or International Facebook groups to share your work, ask questions and be part of a lovely new project. I hope to see many of you on this new adventure. Thanks so much for the newsletter. Looking forward to start the scheepjes cal in February. I’m so glad you’ll be making the video’s for this CAL ❤ They are going to be so helpful!! I love crochet, and I love cross-stitch… But putting those two together is the first for me! Hi Esther it says out of stock on the woolwarehouse site…the notify me box isn’t working either. Will give them a ring tomorrow but wanted to left you know. It will be out of stock because the kits only go on sale February 1st. At this point I believe it is only possible to register your interest for a kit. Thank you. I’ll give them a ring their customer service is brilliant. Hello Esther. I just love the new CAL that you are going to do. As I have no use for a wrap, I was wondering if you think it is a pattern that can be enlarged to a blanket? I’m not sure. Maybe best ask the designer. I was thinking today that it would make a lovely bed runner paired with a plain blanket/bedspread/duvet cover as I’m not sure I’d use a wrap either. I was so stoked to get my bag of yarn today from Wool Warehouse to start my Demelza. Just when I was in absolute euphoria, not thinking it could get any better, I open your page and see the 2017 CAL!!! I am more excited than a kid at Christmas! I have my name on a notify list for the kit when it comes available. I’m SO excited to do both of these projects. Bless you for your dedication to the videos. YOU are a rockstar! Hi Esther!!!!! I’m so happy you are doing the tutorials! I wouldn’t (or shall I say COULDN’T do it without you!! Can’t wait till February!! I really didn’t think, after finishing Sophie’s universe the week before Christmas with almost every finger strapped + bound for my RA/OA I’d sign up to anything else but I saw this today and I’m in! Both feet. I hate Facebook so I am so happy you’re doing video’s, you got me through SU… I follow your YouTube videos + an on IG. I am restyling my house to make Hygge, even hubby said Yes I must do this… Thank you. I can’t wait! Just letting you know you have the wrong link for Wool Warehouse, that link goes to another Scheepjies color pack kit. They actually separated this CAL into three different links. I am very interested in making this, and am happy to see that it is very affordable! I am working hard to finish up my obligatory baby blankets in January so I can work on this as I like! Hi, I don’t have much experience crocheting yet, know all the basics and attempting a throw at the moment. Just love this but not sure if I coul manage it, what do you think? The stitches are not that hard, if you can do single crochet and double crochets, you should be fine. The embroidery is a lot of work but not hard as it is only cross stitches. Thank you, will definitely be giving it a go……..Noe to choose a colour. I wondered how I would ever choose which color set to purchase as they are all stunning. Then I saw they’ve added a fourth colorway: The Danish Mermaid, comprising beautiful blues and greens right out of the sea. Whatever we choose, the finished product will be lovely. Thank you, Esther, for guiding us through another CAL! What would we do without you?! Great CAL. Crochet is not one of my skills but the work you have chosen is so beautiful that I have decided to join había adventure. Hola Esther, somos dos chicas que nos hemos enamorado de la preciosidad de el xal de croxet que has preparado para el proximo cal, en primer lugar, queria felicitatarte por esta maravilla que has confeccionado, y en segundo lugar preguntarte si hay posibilidad de seguirlo en espanyol, somos de Barcelonay pertenecemos a un grupo de chicas que tejemos y nos reunimos dos dias por semana, de momento solamente lo seguiriamos nosotras dos y como puedes ver no dominamos el ingles, i tambien saber si podriamos conseguir la lana. This CAL will be available in English. I know that some did Sophie’s Universe in 1 or two colors & they turned out beautiful! Do you think the same could be done for this wrap? I’m really a neutral kinda girl & all of the kits though lovely, wouldn’t be something that I would wear. I think the wrap would look amazing in just two colors. For example a cream background and all the bobbles and cross stiches in brown or black. Basically all the cotton bits in one color and the stonewashed in another. How can i order the kit? The kits go on sale 1 february. You can use any of the links in this post or go directly to one of the suppliers. For International shipping Wool Warehouse and Deramores are good options. for exchange rates, please ask the retailer you are ordering from. I don’t know all the retailers that are selling the kits. You can best ask in the facebook group hosting the cal. Can you tell me what time of day each stage gets released. We are 7 hours ahead of Amsterdam time and 8 hours from GMT from Western Australia. I am thinking of releasing it 6am Dutch time so that as many people as possible have a chance of being awake when a new part is released.